Preheat over to 350°F. Lightly grease 8x8x2-inch pan. Rinse fresh Wild Blueberries. If using frozen berries, partially thaw in microwave for 30 seconds. Drain if necessary. In small bowl combine flour, sugar, baking powder, lemon peel and salt. In another bowl mix egg, milk, applesauce, melted light butter, and lemon juice until well blended. Add to flour mixture, folding gently to combine. Do not overmix. Batter will be stiff. Gently fold in Wild Blueberries. Spread batter in prepared pan. Bake 30-35 minutes. If frozen berries are used, add 5-10 minutes to cooking time. When cake tests done, pour lemon glaze evenly over the top. Return glazed cake to the oven and broil 3-5 inches from heat until glaze begins to bubble, being careful not to allow sugar to burn. Melt light butter, stir in 1/4 cup sugar, and 1 tablespoon lemon juice. Cook and stir over low heat until the mixture is bubbling. Remove from heat and follow cake directions above. 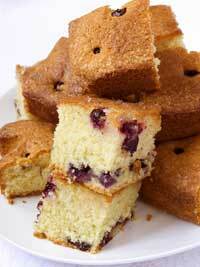 Lemon Glazed Wild Blueberry Cake serves 9.